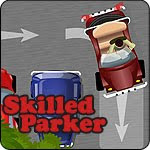 Become A Skilled Parker. Park your car in the parking slot. Instructions: Use UP arrow to move the car forward. Use DOWN arrow to move backwards. Use RIGHT arrow to move the car to the right, and use LEFT arrow to move car to the left. Remember, you have only 60 seconds to park your car in the parking slot. If you hit other cars, then your car will take damages.